We sell and service the Daniels DMX QUAD 100 mixer. For all your mixing needs. The 100 mixers are reliable well built machines. Easy to remove paddles, no wrenches needed. Two safety switches. Forward and reverse mixing. LED timer, displays hours and minutes. Two hopper locks. The DMX QUAD 100 has two paddles, that rotate in opposite directions. The DMX 100 has one paddle. Drain plug on hopper. Clear hopper lid. 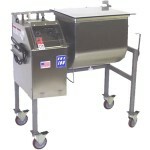 Available options: Stainless Steel Grated Lid, Pour Spout, Frame Extension and Hydraulic Lift.